I SHOULD warn you: this post contains ugly language, the c-word in fact. It wasn’t me. It was somebody else, somebody I don’t know. LAST night’s update wondered whether any of Camden’s political groups ever had a bad session on the campaign doorstep, such is the abundance of tweeted canvassing pictures insisting that there has been a great response from voters… every single time. But a clue emerges tonight that this might not actually always be the case. A Conservative canvasser knocking on a small sample of doors in Belsize Park last month seems to have gone away with a bit of a flea in their ear, specifically about Conservative Justice Minister Chris Grayling. 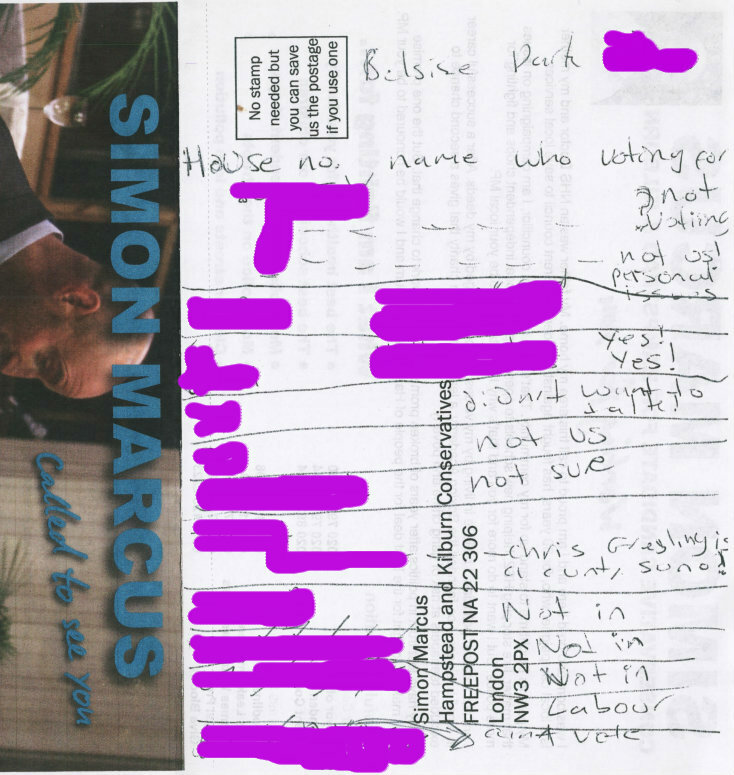 It is claimed their record, apparently scribbled on the back of one of Simon Marcus’s leaflets, was later absently-mindedly posted through the door of a someone who presumably supports another party. The scan below then landed in the leakbox. The notes from the session, albeit a short round of knocks which didn’t cover a quarter of the road in question, suggest two people did confirm their intention to vote Conservative, two people at the same doorbell that is. But it’s difficult not to be drawn to the dry ‘so no’ entry in the matrix following an angrier response at another house. ‘Chris Grayling is [the rude word here] so no’. Even on a small sample, I think that is a pretty bad canvass return for a Tory campaigner. It’s at least 5 Against and only 2 For.